I’m rather surprised to be one of the first to review this whisky, given the attention it’s received in the forums and blogs during the last year. It took a while to find its way here to northwest Indiana, and I’ve been drooling in anticipation like my dog waiting for the remnants of a bacon cheeseburger. I visited my local libationist this afternoon, having planned and budgeted for a twin-pack of Old Pulteney half-bottles (12 & 17 yo – great deal if you can find it! ), but I was more than willing, delighted in fact, to change my plans once I saw this big blue beast on the shelf. It was even on sale, so I saved the extra ten bucks I would have spent on the Old Pulteneys. First, however, a quick side note about the packaging. What looked so wrong in the pix I’ve seen online, what with the teal overkill and self-aware austerity, looks downright bold and ballsy up close and in person. The container’s even all-metal, the kind you want to save for display or a poor man’s flower pot (assuming poor men buy sixty-dollar bottles of whisky). Very imposing. Even if you don’t like it, it’ll force you into liking it, damn it! Soooo…here we go. Tearing the seal (a challenge ‘cause I just trimmed my nails yesterday), popping the cork, pouring a dram as carefully as if I were serving the Queen. Taking a moment to appreciate the un-colored, un-chill-filtered, 46% beauty of it all. Hard to be a skeptic about this sort of stuff, you understand. First nose: Wow. A big outdoorsy blast that settles down quickly, then seems to change with each sniff. Citrus, pine, and sea air dominate at first, then I get a big touch of…peat?? I thought the Laddie was unpeated? Were the barrels previously used for peated whiskies, or is this just a by-product of the Islay air? Whatever, it works. It’s just unexpected. After sitting for a few minutes, it’s soooo much more delicate. Peat tones (or what I imagined to be peat tones) diminish, replaced by a touch of sweet wood smoke trying to break through a whole lot of fresh sea air. Some vanilla. Is that, um, bacon? Light and subtle, but full of secrets. Worthy of further study. A fascinating first nose. First taste: This may be the slowest, chewiest taste I’ve ever taken of any whisky. I suppose it’s a good sign that I hadn’t planned on doing that. Arrival is a blend of fruits and candies. Very tasty, unique, even attention-getting, but surprisingly soft. More going on than I can grasp in one taste. Development: Soft traces of vanilla cake lightly sprinkled with sea salt. Again, surprisingly soft. Very pleasant with ongoing subtle changes. If I had to stop at this point, I’d say the Laddie is a very satisfying, if not overwhelming, whisky. If the layers aren’t obvious at first, the quality is. During its long time in my mouth, I thought this would a B+plus whisky: good stuff, but let’s see what the Laddie’s got when he’s a teenager. But then, at long last, came the development. Nice…sharp, spicy, citrus-y. Say, it’s hanging on, isn’t it? Wow, getting hotter, spicier, smokier, more burnt sugar-y. Oh migawd, this is terrific. It just keeps intensifying as the flavors from the arrival and development make a return appearance. I don’t want this to end – and it’s not! There’s still a big sweet-and-bitter woodsy burn that lands soft as a pillow for an encore. And it all lingers around for minutes, slowly floating away on a cotton-candy cloud. The only semi-negative comment I have is that the Laddie Ten’s youth is both a strength and a weakness. A strength because its mishmash of vague, youthful flavors makes for a surprisingly pleasant experience (as well as another testament to quality). But a weakness because you know those flavors are only going to grow stronger and more defined over time. Here’s hoping that’s what happens. I didn’t touch upon the recent corporate goings-on at Bruichladdich, mainly because I’m not qualified to comment, and the news is still too new. I just hope there’s plenty of this batch to go around when the Laddie is old enough to vote. Well, so much for my proofreading skills. You'll notice in my review where I said "development" but obviously meant "finish." Thanks for the review! Makes me want to try this really badly, being somewhat of a 'laddie fan. Bruichladdich changed distributors into Australia recently and still waiting for this to hit the shelves - I've been told by a very reliable source that this is happening right now and should be in selected retail outlets soon. Can't wait! Also, AFAIK the standard line of Bruichladdichs are still lightly peated (more than Bunnahabhain though) so your tastebuds are probably spot on there - the moderate to very highly peated whiskies are now reserved for the Port Charlotte and Octomore labels as is their product strategy going forward. No more "schizophrenic" bottlings and ACE'ings of their old stock - they only did that to make enough money to tide them over until their new spirit matured (which we are seeing now in the Laddie Ten and previously in their younger Port Charlottes etc). Fantastic review! My first bottle's sitting in my cabinet (along with the Laddie 16 and Laddie 22) ready to be tasted. After your review I'm definitely looking forward to it. No peat smoke for drying the barley for The Laddie Ten, but it comes from a very peated water source. Very good review! It was interesting yesterday to taste this one with the memory of the PC10 still mostly intact. And well, its a lot like the PC10 but without the peat and smoke. Same farmy, herbal, meaty and tropical notes and oily texture. 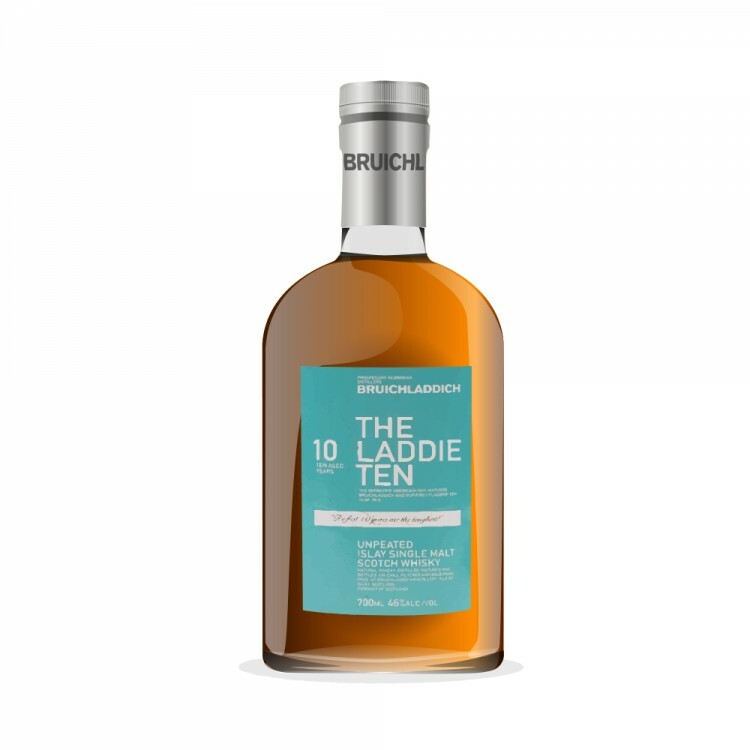 How does the Laddie 10 stack up against the Rocks (which I am a fan of)? @WhiskyBee, @Dramlette and I were both hooked on The Laddie Ten from the very first sip. Thanks @PeatyZealot and @Victor for the comments on an old and naive review. You've made me want to return to the Laddie, which I haven't for months. I may post some revised notes here once I see if and how my palate and (second) bottle have developed in the last 16 months. @FMichael - Haven't tried the Rocks! It's at the local store. I might pick it up one of these days. Whoa! Careful with an old open bottle of Laddie Ten. Could be a problem. One of my favourite 'Laddichs! @Victor - How right you were! I haven't opened my (second) bottle since last summer and what I'm tasting now doesn't match any of my notes above. I don't think I gassed it, unfortunately. All traces of peat are pretty much gone. Seems more oily than before, which is nice. Nose and palate are very weak; this is all about the finish now. Sweet, woody, and--I hate to say--maybe a little soapy. I drank my first bottle and half of the Laddie fast enough not to notice the changes. One to decant or drink fast, apparently. @WhiskyBee, yes, I would decant The Laddie Ten in the first couple of weeks it is open. It is one whisky on my fast-deteriourating "Drink, Decant, or Gas" List. Actually The Laddie Ten is the only whisk(e)y in which I have noted great deteriouration DESPITE using the gas. I am not sure whether that is because of inadequate use of the gas, or for some other reason.